Laredo Community College Granted Accreditation. Laredo Community College has been granted a six year accreditation of their Heating, Ventilation, Air Conditioning and Refrigeration (HVACR) program. Laredo Community College wanted to validate that they were preparing their students for the ever changing challenges in HVACR industry. To accomplish this, they decided to pursue accreditation of their HVACR program. Programmatic accreditation is where an independent third party, reviews a program against set educational and industry standards. In the HVACR industry accreditation is conducted by HVAC Excellence. In seeking accreditation, the staff at Laredo Community College completed a self study evaluation of their program against set standards in: curriculum, faculty, student facilities, placement services, financial aid, and advisory committee involvement, training facilities, equipment & safety. The self-study once completed was sent to HVAC Excellence for their executive team to thoroughly assess for compliance against each standard. Upon completion of their review, HVAC Excellence selected a group of industry veterans with combined technical, administrative and teaching experience in the HVAC industry to validate the self-study through an intense review of the program. Having reviewed the self-study and evaluated the program, HVAC Excellence has decided to grant a six year accreditation of the Laredo Community College program with commendation. The accreditation validates that the program is preparing students for jobs in the HVACR industry and verifies that the program has the needed resources and administrative support to accomplish their goals. In 1947, at the end of World War II, Laredo Junior College was created on the historic site of Fort McIntosh to prepare returning soldiers entering the workforce. 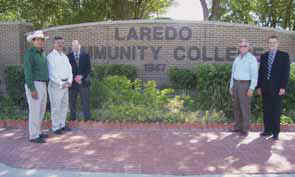 This was the beginning of Laredo Community College offering the growing Laredo community excellence in education. Over the years, Laredo Community College has grown into two campuses which offer one semester, one or two year certificates and Associate of Applied Science degrees. In LCC’s commitment to growth and excellence with their programs, they sought out a third party verification of their HVACR program. This distinguished programmatic accomplishment can only be met by achieving the highest levels of instruction mandated by HVAC Excellence. Some of the benefits of HVAC Excellence HVACR programmatic accreditation include: students can have more confidence in the HVACR program, employers have the assurance that the graduates are properly trained, creates goals for self-improvement, can assist the students in the acceptability of transfer credits and it involved the faculty in the evaluation process. The Mechanical Contractors Association of America (MCAA) and the United Association (UA) represent over 3,000 premier employers and a workforce of nearly 400,000. They have made a commitment to recruiting HVACR technicians from schools with HVAC Excellence credentials as a top priority and will provide new hires advanced placement into their apprenticeship programs. Laredo Community College is now listed on www.5starcareers.com the HVACR recruitment site where individuals can learn about career opportunities and fi d the top programs in the country to prepare them for success.